LAKE OSWEGO, Ore. (BRAIN) — Yakima Products has formed an exclusive partnership with Quality Bicycle Products, naming them as the brand’s specialty bike dealers’ U.S. distributor. BLOOMINGTON, Minn. (BRAIN) — QBP has introduced a mobile app that allows retailers to search the distributor's catalog of more than 45,000 products. The Apple- and Android -compatible app also lets retailers scan bar codes and submit carts. MIAMI (BRAIN) — J&B Importers has entered into a distribution agreement with Tubus and Racktime to distribute the brands' touring racks in the U.S.
LETHBRIDGE, Alberta (BRAIN) — Reid Cycles has entered the Canadian market, with sales through Step 4 Distributing in Alberta. BEND, Ore. (BRAIN) — Quality Bicycle Products will start distributing Zealios body and hair care products in 2018. SAN DIEGO (BRAIN) — WeeBikeShop has signed with Muna Bicycles to distribute the South African brand's premium balance bikes in the U.S. market. BLOOMINGTON, Minn. (BRAIN) — QBP will hold its 2018 SaddleDrive event Aug. 20-24 at Seven Springs Resort, which is an hour away from Pittsburgh. REDLANDS, Calif. (BRAIN) — Five Ten has reached a new Canadian distribution agreement with Live to Play Sports. Starting Jan. 1, 2018, Port Coquitlam, British Columbia-based Live to Play will have exclusive distribution of all Five Ten bike and climbing products in Canada. 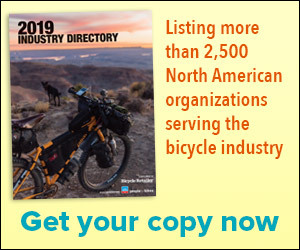 VENTURA, Calif. (BRAIN) — Zeitbike has added a new category of products: Zeitbooks. The distributor is now carrying some classic cycling-related books, including "The Rules" by the Velominati, "World of Mountain Biking" by Hans Rey, and "The Brooks Compendium of Cycling Culture" by Brooks England.